Let’s talk invitations and save the dates, and any other paper product you might want/need for your wedding day! Because once you have your wedding date, wedding venue and of course, your photographer, you need to get the information to your loved ones. If you have been following me for a while, you know I LOVE COLOR - give me bold and vibrant, give me pattern, give me something that is going to stand out. These watercolor save the dates and wedding invitations by basic invite are perfect for any wedding day, and are so fun to customize for your special day! Their color options are nearly endless! It was important for me to have them specifically branded with my brand colors - and matching them was easy. Then, you are able to customize each part of the watercolor save the date or invitation with your colors. In the invitations I customized, I was able to change the colors of the leaves, the background, the font and even the individual flowers. So, you can make sure the card is exactly how you want it - down to the smallest detail. You are even able to choose from 40 different envelope colors! Basic Invite allows every customer the ability to order their custom invitation as a printed sample. Printing and shipping take 7-11 days, so make sure to take that into account. 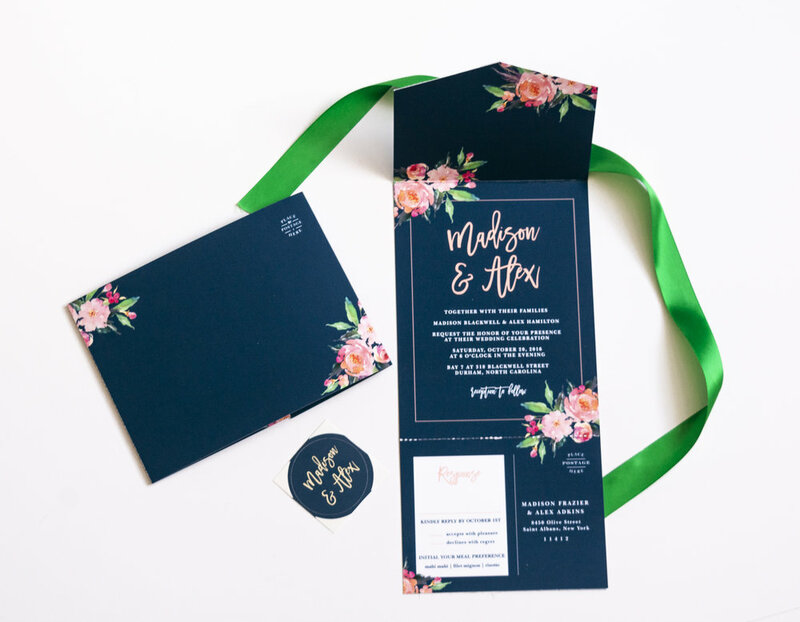 However, once you get the invitation, you will know exactly what your invitation suite will look like, you will get to touch the product - and then you can make changes or order them for your wedding. Another invitation that I loved, was their Seal & Send Wedding Invitations. It is an all-in-one wedding invitation with a tear-off RSVP postcard included! I thought this was great from a wedding guest point of view. Everything is attached, so there is no need to wonder if they are going to misplace the RSVP. Additionally, the with the Seal & Sends the guest's addresses are printed on the front of each invitation which means no envelope necessary! You can share a link, collect guest addresses, and upload them onto your design, instantly. Then when you receive your order add postage, fold your invites, and secure them with a sticker! Nice and easy! Each portion of your invitation suite can also have a background, which I thought was awesome. There were a ton of patterns to choose from and you can also change the colors! They also have a ton of other accessories to highlight your wedding day, like their wedding coasters! How fun would it be to have your own coasters at your wedding!!!! They have over 90 professionally designed looks. Each design can be personalized to match your wedding colors. (Remember, they have up to 180 color options to choose from!) Each coaster is printed using the latest print technology and on a heavy 200lb matte cardstock. With a premium weighted cardstock, those cocktails won’t ruin the clean, crisp design - and your guests will be able to take them home! If you want all of your wedding day details to match, then you can also utilize their free wedding websites. Like their invitations, you can customize your site with 180 color options. (It can even match your invitations!) Their wedding websites are mobile friendly and easy to use - upload your wedding details, photos, maps and directions - everything your guests will want/need to know. **This is a sponsored post; however, I loved the product and everything about the customization process with Basic Invite. I would recommend them to any of my clients!